And he's still suing CTV News. Patrick Brown leaves the Ontario PC Party head offices in Toronto on Feb. 20, 2018. TORONTO — The embattled former leader of Ontario's Progressive Conservative party is attempting a political comeback in the fall municipal election. 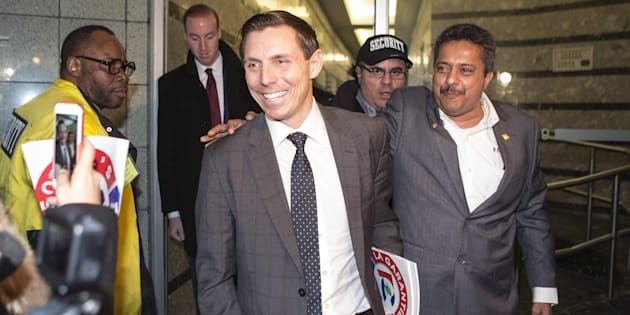 Patrick Brown has officially thrown his hat in the ring to become chair of Peel Region, a position that was previously appointed but will now be elected for the first time. The regional chair is the chief executive officer of the municipal corporation and the leader of the regional council. Brown stepped down as Tory leader in January after two women came forward with allegations of sexual misconduct against him, which he has consistently denied. His resignation months before a provincial election triggered a hastily organized leadership convention that saw Doug Ford take the reins of the party. Ford blamed Brown for a number of issues that emerged during the spring election campaign that culminated with the Tories' majority win. Brown has filed a defamation lawsuit against CTV News, which first reported the sexual misconduct allegations. He has also announced that he is writing a tell-all book detailing what he describes as his "political assassination." Brown is not the only former provincial legislator running for a regional position — former Liberal cabinet minister Steven Del Duca is competing to become chair of York Region, another position that will be elected for the first time.